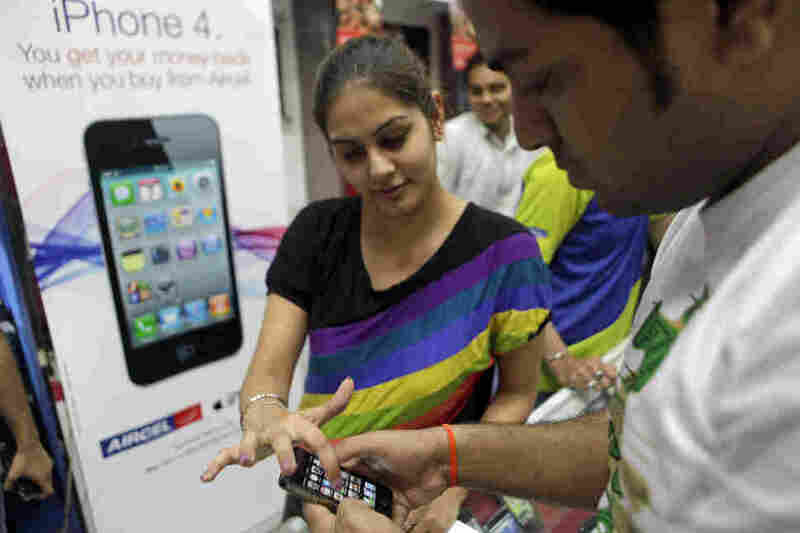 As Developing World Goes Mobile, Can Apple Make The Sale? : All Tech Considered Up to 1 billion people in emerging markets will buy mobile phones in the coming years, and many will use them in lieu of a computer. While this might seem a natural opportunity for Apple, it may be a struggle for the tech giant to land these new customers. With the majority of adults in the U.S. and Europe walking around with smartphones in their pockets, the idea of having a high-powered computer at your beck and call may seem like old news. But globally, the smartphone revolution is just beginning. The next billion people who get online are likely to do so with a mobile device. And while the global democratization of computing power is just around the corner, this trend has left Apple — the company that more or less created the modern smartphone — in an awkward spot. The numbers on smartphones in China are pretty amazing. Next year, analysts expect Chinese consumers to buy 235 million new smartphones — that's twice as many as Americans are likely to buy. And the number of smartphones that will be sold this year in China alone is likely to rival the number of PCs sold in the entire world. That mobile revolution won't be happening just in China but also in Brazil, Russia and India, says Chris Jones, a global market analyst at Canalys. And while those are the four obvious — and biggest — emerging markets, Jones also points to places like Indonesia, Southeast Asia, the rest of Latin America and Africa. In the next few years, hundreds of millions of people in these countries will be getting smartphones and getting online for the first time. "So there's an enormous opportunity there in the emerging markets," Jones says. The social implications for all that smartphone use are going to be enormous. And while that seems like a great business proposition for Apple, this opportunity is actually pretty complicated for the tech giant. Apple's business model is kind of like that of the upscale jeweler Tiffany's. Basically, it makes expensive luxury goods. By catering to desires many of us didn't even know we had — like only letting select callers through when we prefer not to be disturbed — Apple makes a big profit on every iPhone and iPad it sells. Pricey High-End Or Affordable Mass Market? This model works great in countries like the U.S. or Germany, but the vast majority of the next billion people who buy smartphones probably won't be able to afford one of Apple's current products. "They don't really have products that regular people, on the streets of Vietnam or Indonesia or the Philippines or Turkey, can afford," says Sarah Rotman Epps, an analyst at Forrester. So, she says, Apple faces a choice: "Apple sells luxury within reach. And the question is, will they extend that reach to customers in the developing world?" Apple could create a line of products that are more affordable, but that's not a simple business decision. Right now, Apple make hundreds of dollars on almost every gadget it sells. Selling millions or hundreds of millions of cut-price phones would push Apple's margins down. It might have to compromise on quality and could damage its brand. But the other option — largely turning its back on almost 1 billion people about to get online for the first time — isn't very appealing, either. "Of course you can build a successful business targeting a very small number of consumers — if that is what you want to do," says Rotman Epps. "I don't think, though, that jibes with how Apple sees itself as a company." To be fair, Apple sells a lot more stuff in the developing world today than it used to. In 2007, it did just over $1 billion in business in the developing world. In 2011, sales broke $20 billion, and last year sales in China rose more than 67 percent. But as big as those numbers are, these markets are growing even faster. Globally, Apple has not gone after the masses. "I think Apple has been sending very clear signals that they don't expect the rate of growth that they have had to continue forever," Rotman Epps says. "At the same time, I don't think it's reasonable to assume that Apple is done innovating. And I think you have to expect that they'll have new products out." And, she says, maybe some of those products will be focused on a different kind of customer than Apple has targeted in the past.